Treasure, Targes & Tartan too. 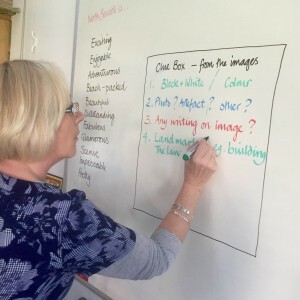 Following on from our engagement work discovering Jolomo, there was whole-school learning through the visual arts in both Dunbarney & Abernethy Primary Schools – it could be said there was a hive of artistic activity. So, let’s have a look at some distinctly Scottish outcomes. All of this fantastic artwork was celebrated in an exhibition Inspired by Scotland, visited by family & friends over the course of several days. 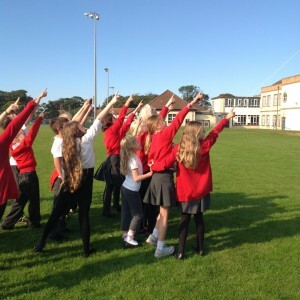 Pupils also performed song, dance & poetry in an expressive arts event, drawing the whole project to it’s conclusion. Finally Scran would like to congratulate the staff & pupils on a job well done! 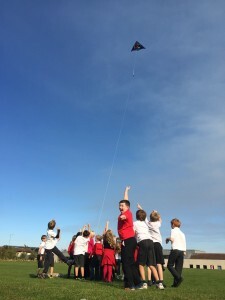 You may have read about our collaborative school activity at Killermont Primary School, in Bearsden? This 6 metre long frieze is the result of P6’s hard work & creative flair. After thinking about the work of Willie Rodger, individual figures were printed by each pupil. These silhouettes represent Bearsden commuters, dashing to and from the railway station. Next, the class cut up pictures of local housing built following the arrival of the railway in 1863 – bringing businessmen & prosperity to New Kilpatrick. Finally, the local buildings & commuters were collaged together. 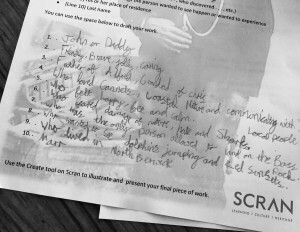 The class proved to be highly successful art detectives too – at home they researched the artist Willie Rodger using Scran. They shared their findings in class the following day. Astute observations were made & we discovered plenty of visual clues hidden in the imagery. Following a group vote, with 6 votes each from of a class total of 32, the two most popular Willie Rodger artworks were The Chess Players & Honeymoon. There was a frantic afternoon of printmaking with P6 yesterday, who worked really hard. Today we are going to consider the detail & visual clues within the work of Scottish artist, Willie Rodger. In particular this example, “Day Out, Ferrara”, from 1998. The class have a selection of questions to investigate and will use Scran to become art detectives, using their visual literacy skills to discover what’s going on in the picture. Our printed figures & silhouetted people, the Bearsden commuters, have been drying on the rack overnight. Next, we will incorporate them into our collaged frieze alongside local landmarks & architecture. We are looking forward to seeing the outcome. © Willie Rodger via Bridgeman Art Library. Licensor www.scran.ac.uk. Scran is spending the next two days working with P6 in Killermont Primary School. Word on the street is, they’re a creative bunch – so we’ve devised a printing project. 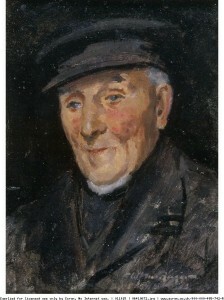 We’ll start by looking closely at the work of local Dunbartonshire, artist Willie Rodger. 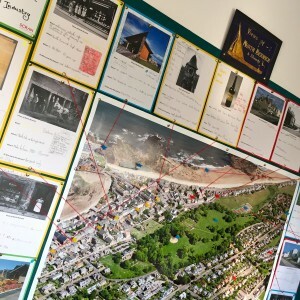 As well as finding out about print-making, P6 will think about their local landscape too and the Victorian commuters who shaped the streets of Bearsden. The collections from East Dunbartonshire Leisure & Culture Trust on Scran will add that extra layer of context for our learning. We’re going to get our hands dirty & by the end, have made a really cool collage. 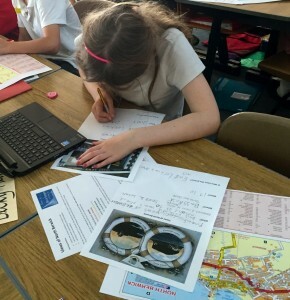 So far this week Law Primary School have thrown themselves into their research & investigation using Scran. 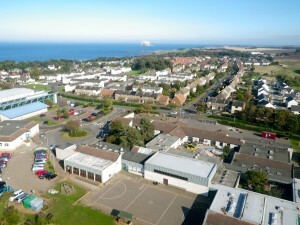 Scran will be working closely with the P5 class at Law Primary School in North Berwick throughout next week. Together we will be examining lots of local content and weaving what we find into our learning journeys. 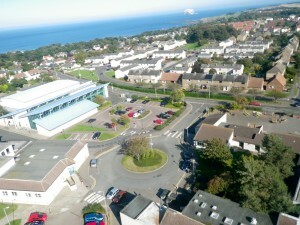 As well as being digital, weather permitting, we’ll be taking to the skies with our camera & K.A.P. kit. 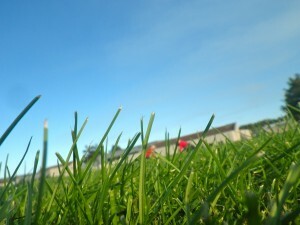 So please, fingers crossed for fair weather over East Lothian. 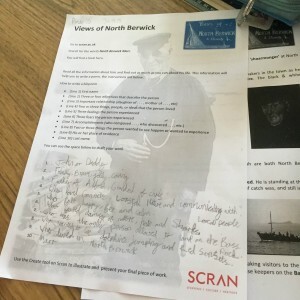 Many of the resources we will use in class come from East Lothian Museums Service who are contributors to the collections on Scran. For example, this rather quaint souvenir is leather bound and originally contained 15 black & white photographs with tinted skies. It was published by Valentine of Dundee around 1895, so it gives us a clue as to how long people have been visiting the beautiful seaside at North Berwick. 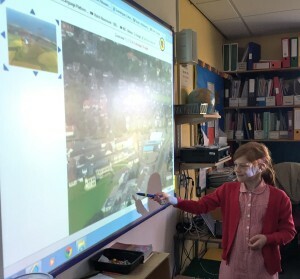 What more will our Primary 5 digital detectives be able to discover about where they live? 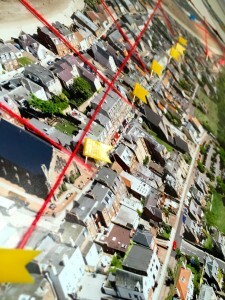 We’ll be looking at lots of aerial imagery, considering how the town has changed and expanded over time. We’ll think about traits & trades which may have remained the same and finally, when we reach the end of our collaborative investigations, we will share our findings – so tenterhooks until then. 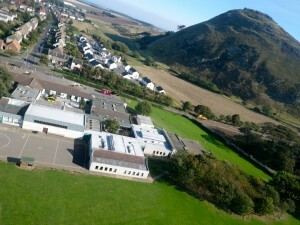 Recently we’ve been getting to grips with the kite aerial photography kits provided by Dr. John Wells of the Scottish National Aerial Photography Scheme (SNAPS). 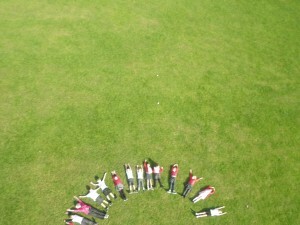 As you can see we visited Tantallon Castle for a practice flight. We were quite pleased with our results & the potential for learning. 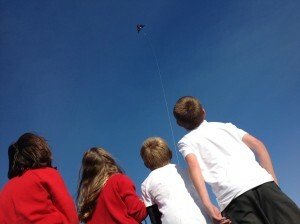 We are planning on piloting this activity with schools over 2015/16, so if you are interested please contact us & lets’s go fly a kite! 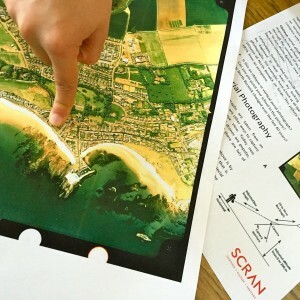 We believe exploring the aerial photography collections on Scran, in combination with the active learning involved in kite aerial photography, could lead to all sorts of creative learning. For example, studying aerial photography can support the following Curriculum for Excellence experiences & outcomes within Social Studies. Hot off the press, the Scranalogue has arrived. 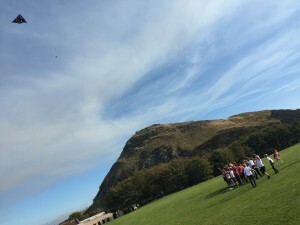 We are delighted to share what’s happening at Scran via our brand new blog. Keep up to date with new content arriving in our many collections, for example we’ve some great new oral histories about Falkirk during World War One. Meet us in person, we’ll be busy exhibiting and supporting events throughout autumn 2015, starting with the Scottish Learning Festival quickly followed by Doors Open Day in Edinburgh.